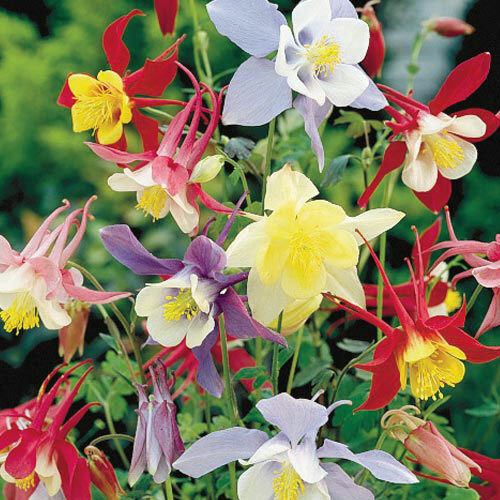 Mixed McKana Giant Columbine | Gurney's Seed & Nursery Co. Spurred beauties grace 2 to 3 ft. stems in late spring to early summer. Enjoy a mix of long-lasting pastel blooms. Plants self-seed readily. Prefers full sun to partial shade. Bareroot. FoliageGrey green, 1 - 1.5 inch deeply lobed leaves. Flower FormFlowers have backward projecting spurs on erect stems. CommentsThis plant attracts butterflies and hummingbirds. DepthPlant with crown at soil level (where the stems meet the roots). If potted, plant at same depth it is in the pot.